The Ada County Sheriff’s Office is the largest local law enforcement agency in Idaho, with 655 employees. That includes 315 commissioned deputies and 323 professional staffers. The Ada County Sheriff’s Office is committed to giving every citizen the best possible service. Our main goal is to ensure Ada County is a safe place to live, work and play. We do that by focusing on the causes of crime, encouraging community participation, and making the best possible use of existing resources. The ACSO is not just responsible for traditional law enforcement. Idaho’s Constitution and state law make county sheriffs responsible for almost every law enforcement function. Ada County Sheriff’s Office deputies patrol unincorporated Ada County and the cities of Eagle, Kuna and Star. 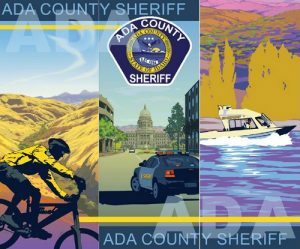 Ada County Sheriff’s employees also manage and staff the 1,224-bed Ada County Jail, run the county-wide 911 emergency dispatch center and fulfill a variety of statutory and cooperative duties. ACSO employees also issue driver’s licenses and concealed weapons permits, patrol county waterways, and serve civil process from the courts. We encourage you to contact us with your ideas, concerns, and questions.